Senator Murray with local, state, and federal officials this morning breaking ground on the state veterans home. (Washington, D.C.) – Today, U.S. 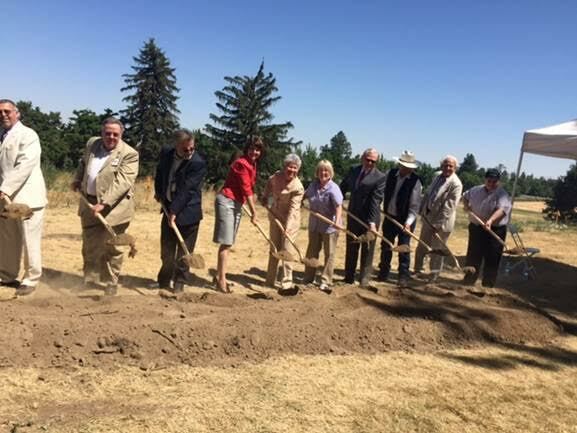 Senator Patty Murray joined local, state, and federal officials to celebrate the groundbreaking of the long-awaited Walla Walla Veterans Home. For more than a decade, Senator Murray has worked with veterans, community leaders, and local officials to support the large veterans community in Eastern Washington. She has consistently pushed VA officials, including numerous VA Secretaries, to commit funding for the Walla Walla State Veterans Home project, and in 2014, secured $23 million in federal funding to help the project keep moving forward. Also in attendance were VISN 20 Director Larry Carroll, Walla Walla Mayor Jerry Cummins, Walla Walla Veterans Task Force Representative Tim McCarty, Walla Walla VAMC Director Brian Westfield, Executive Director of the Port of Walla Walla James Kuntz, and tribal representatives. Washington has state veterans homes in Spokane, Kitsap County and Pierce County, but the southeastern corner has yet to have a state veterans home. The new home is being built on the campus of the Jonathan M. Wainwright Memorial VA Medical Center in Walla Walla and will serve 80 veterans at a time and create 100 local jobs. Earlier this year, Senator Murray cut the ribbon at the new, 67,000 sq. ft., VA Outpatient Clinic in Walla Walla. “I am honored and truly excited to be here today, after many years fighting for the Walla Walla State Veterans Home. After so many years, the reason why this long effort is finally coming to fruition is because you all believe the same thing I do – our veterans in Walla Walla deserve the care and support this home will offer, and we owed it to them to get this done. “The celebration today would not have been possible without several dedicated individuals, who I am proud to call great partners and friends – Alfie Alvarado-Ramos, Director of the Washington state VA, Larry Caroll, Director of our VA regional health network, Tim McCarty of the Walla Walla Task Force, Mayor Jerry Cummins and the former Walla Walla City Manager Duane Cole, Members of the local advisory panel, the Yakama Nation, the Confederated Tribes of the Umatilla Indian Reservation, the Confederated Tribes of the Warm Springs, and the Nez Perce Tribe, who all played a critical role here. And a special welcome to guest Congresswoman Cathy McMorris Rodgers. “There are countless individuals who contributed to the completion of this project who may not be mentioned-but should know their work has not gone unnoticed. And of course, the Walla Walla community is the strong foundation whose work we simply built upon to get where we are today, so I want to say to everyone here today – thank you. “I am proud to stand here with you to celebrate the groundbreaking of a facility that will serve our veterans, and remind us what is possible with a lot of hard work and a little bit of stubbornness. “It took an amazing level of coordinated effort to make today’s veterans home and the continued existence of this VA campus a reality – from veterans here in Walla Walla to local government, state government, and up to the federal government, and several Secretaries of Veterans Affairs. “The story of this campus goes back to 2003 when it was put on a list for closure by the CARES Commission – and then just a year later, despite pleas to consider the devastating effect on the Walla Walla community – its closure was finalized. “I probably heard from every single veteran in this part of the state about how important this facility is. So I took that message straight to President Bush. “I let the President and everyone at every level of the VA know what this facility meant to this region, and how wrong it would be to leave veterans without services here in Southeast Washington. And all of you refused to back down. You wrote, you called, you attended committee hearings, and eventually, we proved to them that this place was more than worth keeping open – it was worth expanding. “After VA Secretary Peake visited in 2008, he announced that after years of fighting for every dollar we needed to keep the doors open, he would authorize $70 million for the state of the art facility that opened last April. “Together, we went from losing this entire facility and having vets drive to Spokane and Seattle for care, to having it taken off the closure list altogether. And after securing $23 million in federal funding last year and having the official land transfer to the state happen just 2 months ago, I am proud to stand alongside you here today in your victory to expand these facilities. “And now, veterans from 10 counties with a combined population of more than 50,000 will benefit from this home. 80 veterans and surviving spouses will have a bed to sleep in, and skilled staff to care for them. This is a community that has let their veterans know – we’ve got your back. “I want veterans in the Walla Walla community to know that I also have your back. As the daughter of a World War II veteran who struggled from multiple sclerosis, I understand how important it is to get support. “And after sacrificing so much for their country, it’s the least we can do to ensure veterans are properly cared for by their community and their government. “I consider one of the most important parts of my job to be listening to the people I represent in Washington state, and sharing your stories in DC. As a senior member of the Veterans’ Affairs Committee, I vow to keep fighting the good fight to keep veterans in this facility taken care of, and veterans all across Washington state. “I can’t say it enough – I am so thankful to have had such an outstanding group of dedicated people here in Walla Walla to work with all these years. It’s people like you who inspire me to keep doing my job the best I can–people like you who show us how we should be caring for each other and making our communities – and our country – a better place.